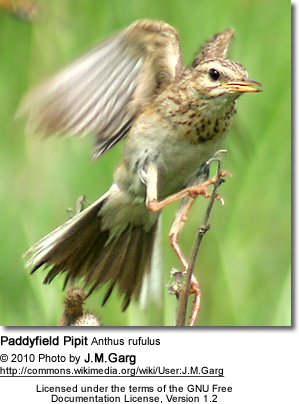 The Paddyfield Pipit (Anthus rufulus) is a small passerine bird in the pipits and wagtail family. It is a resident breeder in open scrub, grassland and cultivation in southern Asia east to the Philippines. Although among the few breeding pipits in the Asian region, identification becomes difficult in winter when several other species migrate into the region. This is a large pipit at 15cm, but is otherwise an undistinguished looking bird, mainly streaked grey-brown above and pale below with breast streaking. It is long legged with a long tail and a long dark bill. Males and females look alike. Summer and winter plumages are similar. Young birds are more richly colored below than adults and have the pale edges to the feather's of the upper parts more conspicuous with more prominent spotting on the breast. The population waitei from northwestern India and Pakistan is pale while the population malayensis from the Western Ghats is larger, darker and more heavily streaked with nominate rufulus intermediate. Similar Species: In winter some care must be taken to distinguish this from other pipits that winter in the area, such as Richard's Pipit, Anthus richardi and Blyth's Pipit, Anthus godlewskii. Paddyfield Pipit is smaller and dumpier, has shorter looking tail and has a weaker fluttering flight. The usually uttered characteristic "chip-chip-chip" call is quite different from usual calls of Richard's Pipit (explosive "shreep") and Blyth's Pipit (nasal "pschreen"). Tawny Pipit has less streaking on the mantle and has a black loreal stripe and a longer tail. 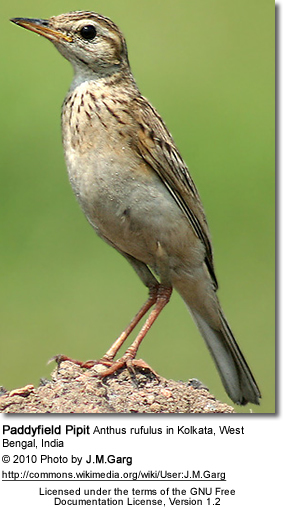 The Western Ghats population can appear very similar to the Nilgiri Pipit. Some of the subspecies in the group were formerly treated as a subspecies of the Australasian Pipit Anthus novaeseelandiae and the grouping has been in state of flux. Considerable colour and morphological variation with age and latitude make the species difficult to identify museum specimens. Six subspecies are now included in this species. rufulus described by Vieillot in 1818 - found in most of Indian Subcontinent (except NW, N and extreme SW) E to S China, S to S Thailand and Indochina. lugubris described by Viscount Walden in 1875 - found in Philippines; possibly also N Borneo. albidus described by Stresemann in 1912 - found in Sulawesi, Bali and W Lesser Sundas (Lombok, Sumbawa, Komodo, Padar, Rinca, Flores, Sumba). medius described by Wallace in 1864 - found in E Lesser Sundas (Sawu, Roti, Timor, Kisar, Leti, Moa, Sermata). A wide spread species found in open habitats, especially short grassland and cultivation with open bare ground. It runs rapidly on the ground, and when flushed, does not fly far. Breeds throughout the year but mainly in the dry season. Birds may have two or more broods in a year. During the breeding season, it sings by repeating the note during its descent from a short fluttery flight, a few feet above the ground. It builds its nest on the ground under a slight prominence, a tuft of grass, or at the edge of a bush. The nests are woven out of grass and leaves and are normally cup shaped. Exposed nests are sometimes domed or semi-domed, the long grass at the back and sides extending over the top.Nests are lined with finer grass or roots and sometimes with a little dry moss, bracken or other material at the base of the nest. The usual clutch is 3-4 eggs with greenish ground color and numerous small brown specks at the larger. When disturbed near the nest, the birds flutter nearby with weak tsip-tsip-tsip calls. Parent birds may also feign injury to distract predators. It feeds principally on small insects but consumes larger beetles, tiny snails, worms etc. while walking on the ground, and may pursue insects like mosquitoes or termites in the air. A species of Haemoproteus, H. anthi, (a parasite) has been described from this species.